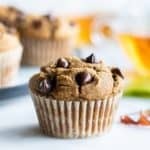 The BEST Healthy Pumpkin Chocolate Chip Muffins! 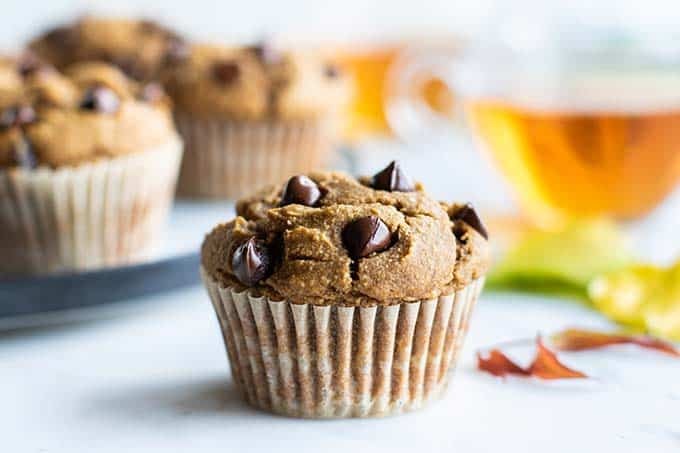 These super soft, gluten free pumpkin muffins are refined sugar free, and stuffed with lots of dark chocolate chips. Not to be missed! If you love healthier versions of your favorite treats, you’re in the right spot. 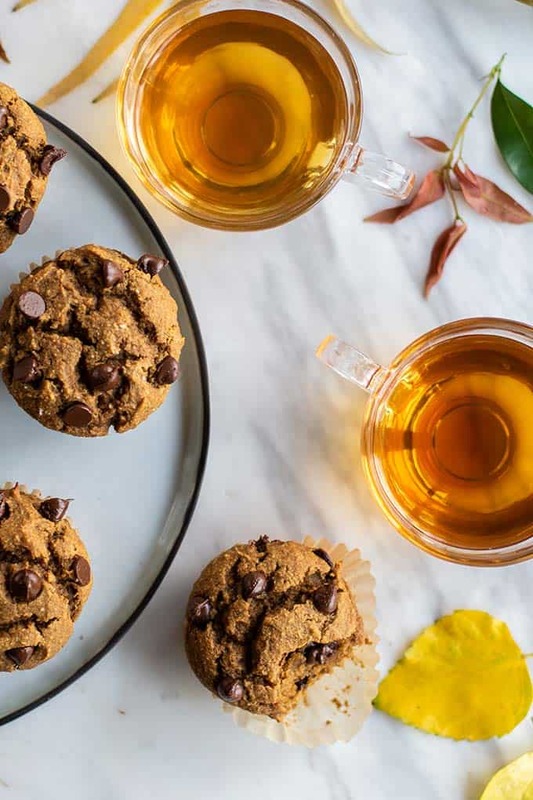 Who could go through fall without a spiced pumpkin muffins? The dark chocolate chips take these over the top! Pumpkin treats can actually be very healthy! 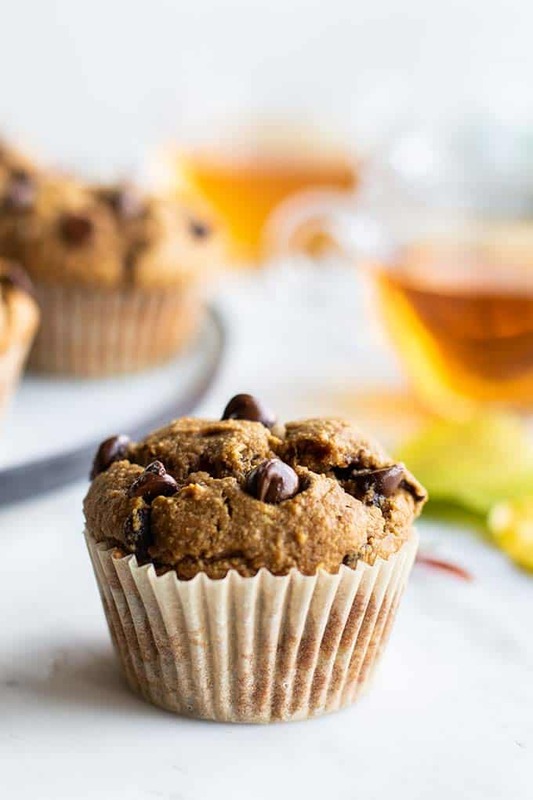 Using pumpkin works as an oil replacer, so these treats are lower in fat than typical muffins, and I’ve used high protein and fiber oat and almond flours, and sweetened them with date syrup (or honey). 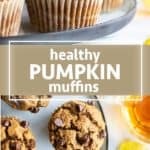 This delicious pumpkin muffin recipe is sure to be a favorite! Make a Small Batch — or Double the Recipe and Freeze Some! This recipe was developed for the Sharp Superheated Steam Countertop Oven (<– my new favorite kitchen appliance). I never thought I needed a 2nd oven – but I am so glad to have one! I love freshly baked food – whether it be roasted veggies, a casserole, or muffins like these. What I don’t like is microwave heated food. When I am home working during the day, it feels wasteful to turn on the whole oven to reheat my lunch. But using the Sharp Superheated Steam Countertop Oven? Not at all! It’s quite roomy inside, about the size of a microwave, meaning much more energy efficient when cooking smaller amounts of food. Another potentially wasteful thing I like to do? Reheat chocolate chip cookies or muffins like these, so they taste freshly baked. The Sharp Superheated Steam Countertop Oven has a small compartment you fill with water prior to each use, which emits a superheated steam in the oven. This means food bakes super moist. 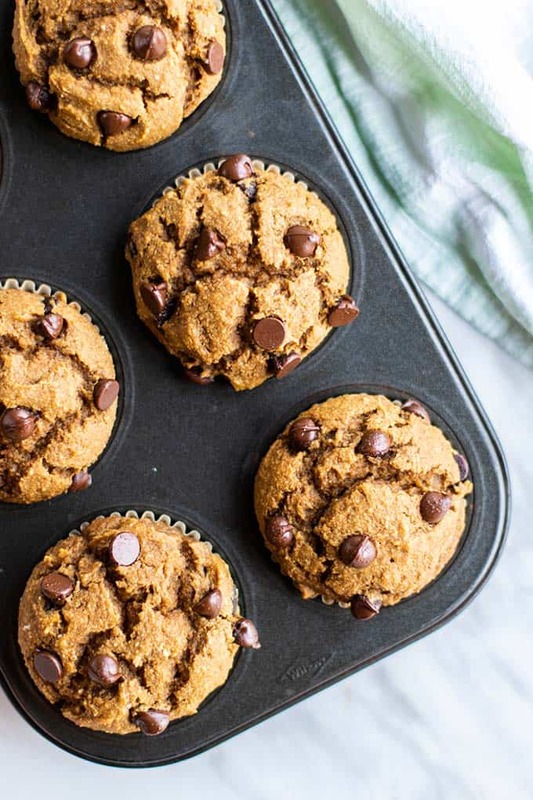 This recipe makes 6 healthy pumpkin muffins. Of course I added dark chocolate chips to mine! Sub walnuts, raisins, or dried cranberries, if those are more what you’re feeling. You can also double this recipe. A 6 cavity muffin tin fits perfectly inside the steam oven. If you’re like me, you’ll opt to make a small batch, and then another one once those are finished! My 2 favorite gluten free flours to use are oat (certified gluten free, if necessary!) and almond. Together, they make the best soft and naturally sweet baked foods! Oat flour can be purchased, or you can also make it at home from whole oats. Just add oats to a blender, and blend until a fine flour forms (a minute in a high speed blender, longer in a standard one). I’ve tested these muffins with both homemade oat flour, and store bought oat flour. 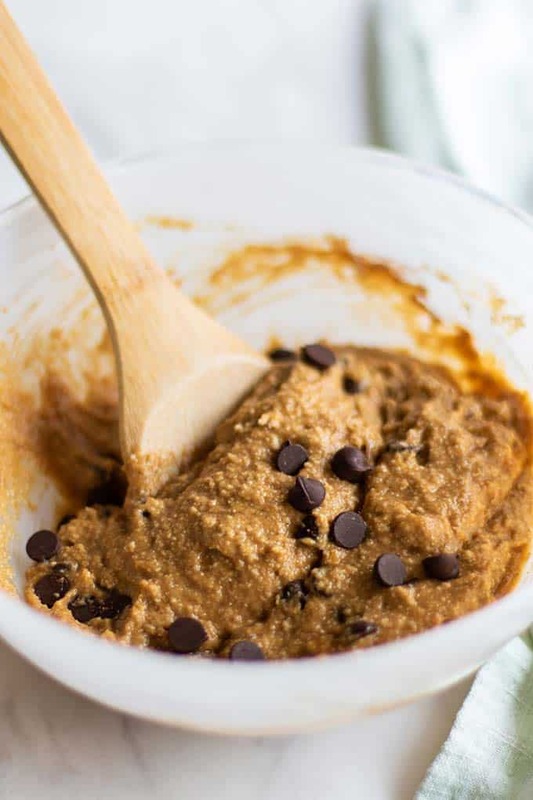 Store bought oat flour is finer in texture than is possible to make in a blender, so sometimes they are not interchangeable. This recipe is actually great with either one. 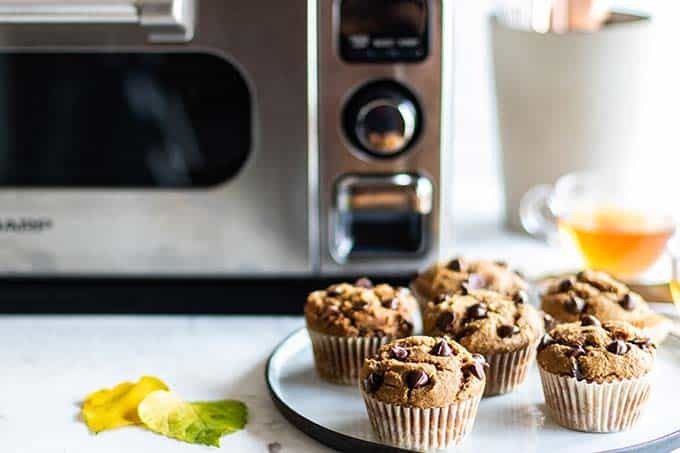 These bake in only 16 minutes in the Sharp Superheated Steam Countertop Oven — so whip up a batch, and by the time you’re done washing the bowl and making a cup of tea, you’ll have one of these ready for the perfect afternoon snack (or weekend breakfast, or evening dessert!). Your family will thank you! 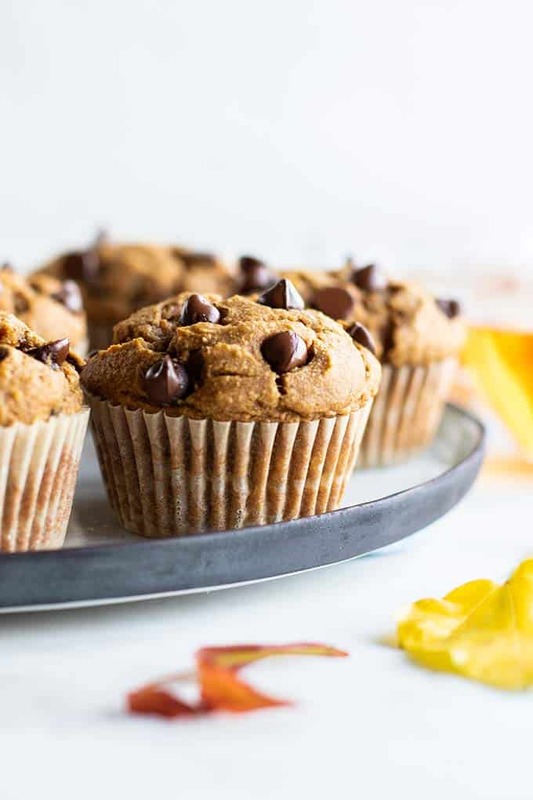 Gluten free pumpkin muffins, stuffed with lots of dark chocolate chips! 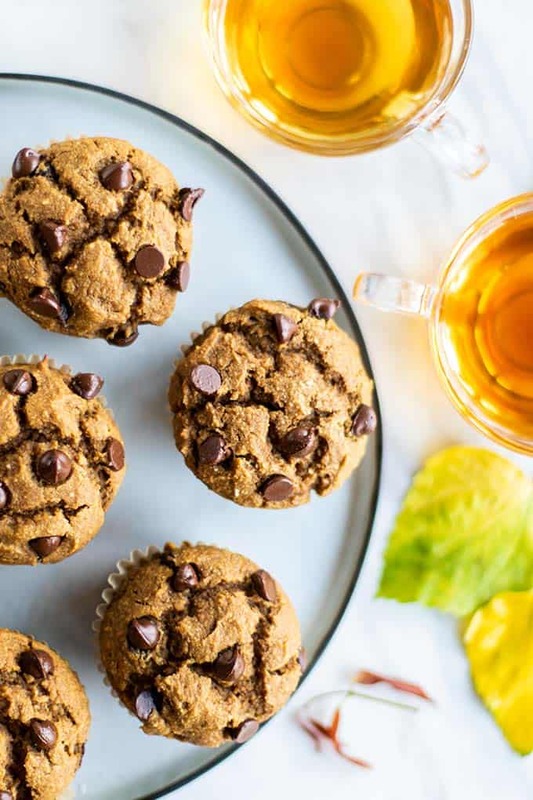 This healthy pumpkin muffin recipe is a great base for any addition - if you're not feeling chocolate chips, try walnuts, raisins, or cranberries. Perfectly soft and extra moist, lightly sweet, and plenty of fall spice! 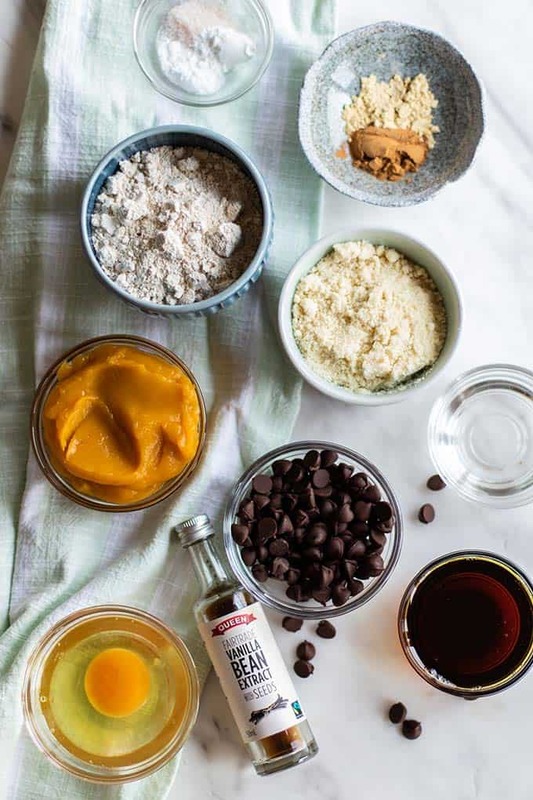 In a mixing bowl, add pumpkin, date syrup (or other liquid sweetener), egg, and coconut oil. Mix well. Add in the spices, baking powder, soda, and sea salt. Mix well. Add oat flour and almond flour, and mix until just combined. Fold in chocolate chips, reserving a few to top muffins. Line a 6 cavity muffin tin with cupcake papers, and then divide the batter equally. Top with a few chocolate chips, if desired. Bake in the Sharp Superheated Steam Countertop Oven at 375 degrees F for 16 minutes. If using a conventional oven, remember to preheat it to 375 degrees, and bake the muffins for 22-24 minutes. 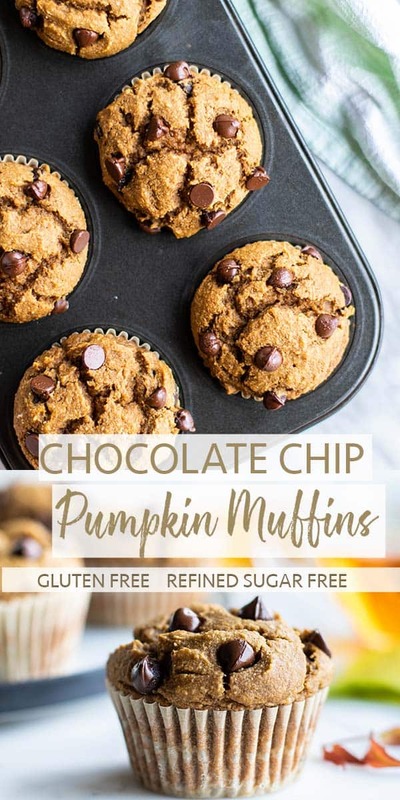 This Healthy Pumpkin Chocolate Chip Muffin post may contain affiliate links, meaning if you make a purchase, I will receive part of the sale as a commission. This helps me continue to bring you lots of fresh and inspired recipes! This is just a perfect treat! I love these cute muffins! Thanks Tania -- my son calls them "cupcakes" -- he's such a sugar/carb monster, so I love knowing he's at least getting some healthy fats and veggies with this chocolate!